This Jama Masjid ( Friday mosque) is the largest mosque in India. It is located in Old Delhi and was built by the ruler who built the Taj Mahal. Eid is the celebration of the end of Ramadan. There was a Friday Mosque in the Pols or old city of Amadavad. They need to be large because the followers go there to pray on Friday, their holy day, if at all possible. I hope you will watch the short video to have architectural details of mosques explained. I have to admit, I am partial to the elegant simplicity of mosques. . . symmetry, lack of figure decoration, use of marble and other beautiful stone. Women in most mosques have their own separate place to pray away from the men. We also visited a mosque where women are not allowed to enter, including tourists, into the mosque itself even if it is not prayer time. In our travels, we tried always to be good visitors and obey the rules of the culture. The pilgrims, either tourists or the faithful, enter the site climbing up many, steps steps, as a metaphor of our life journey. At the entrance everyone removes their shoes. In our first group , we had a very tall boy who was always afraid his expensive large sneakers would be stolen. We would always laugh as we never saw in 6’4″ Indians! Some of the boys had on shorts and had to rent a piece of cloth to cover their legs. All women had to cover their head to enter the courtyard. The students always had their sketch books handy to sketch a detail here or there. Crowds of Indians would gather around them as if to see magic from their drawing instrument. Someone had the idea of asking the watchers to autograph a page in the sketch book. This was met with much laughter. A 12 year old boy was asked to sign his name. Then there was a surprise for all the American students. The boy shook his head. . . .he didn’t know how to write his name. He had been selling inexpensive trinkets since he was a tiny boy to help his family with the few rupees he made. He had never gone to school. This is the desperate fate of many poor families in India! 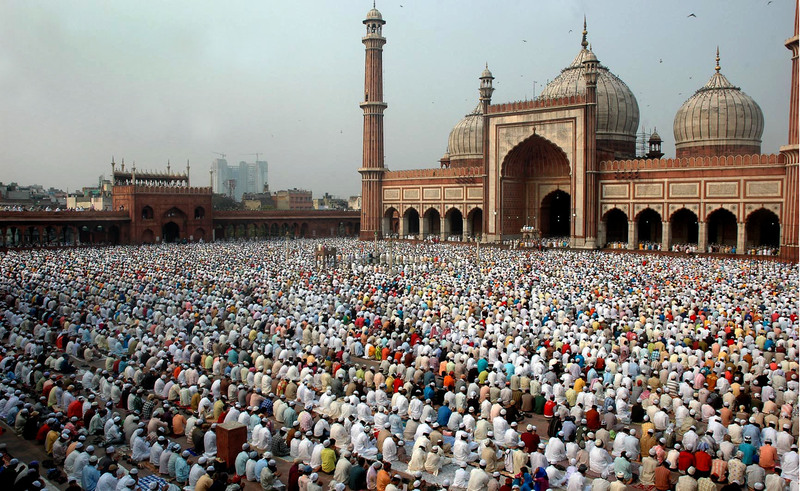 This entry was posted in Architecture, India, Religions of the World, Uncategorized and tagged architecture, Eid, Friday mosque, Islam, Jama Masjid Mosque, largest Indian Mosque, Old Delhi, Religious architecture. Bookmark the permalink.